Happy Friday friends! I want to start off today's post by giving you all a huge "thank you" for your feedback on yesterday's post. It wasn't the easiest post to write and put my true goals out there, but your responses have been overwhelming. I've gotten a lot of great advice from bloggers that I really look up to, and a lot of positive feeback about the direction GretchRuns is heading. I can't even begin to explain how good that feels! Enough of the sappy stuff, let's get into some favorites for the week! Marathon training just started for me, and reading this book couldn't have come at a better time. If you're looking for a story and a person to inspire you, look no further. 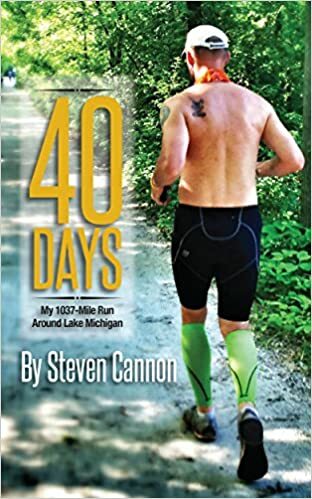 Steven decided to run around Lake Michigan in just 40 days- the equivalent of running a marathon a day for 40 days- to raise money for cancer research. His struggles and triumphs throughout the book are amazing, his personal stories of the ways that cancer affected his friends and family are heartbreaking, his tales of the shenanigans he and his friends get into are hilarious, and his entire story is such an inspiration. Each chapter represents a day, and each one tells a new story or teaches a lesson. Running has so much to offer beyond the physical. Those who judge their running success by time and distance miss a great opportunity. It is similar to judging the ocean only by what is visible from the shore. In both, just beyond the surface lies an endless resource for those who wish to explore. Steven was gracious enough to let me read his book for free, and if you're interested in reading it check it out on Amazon*! Be sure to follow him on Twitter (he's pretty cool, even if he's a Hawkeye! Sorry Steve..Penn State forever!) ETA- Shaun is giving away two copies of the book on his blog! Make sure you go enter! Did anyone play the Powerball this week? It seems like that's what everyone was talking about- even my bus driver was joking about us having to walk home on Thursday if he ended up winning (luckily for me, he showed up on Thursday so I guess he didn't). I don't like to gamble, but Dan surprised me at the store last week with a ticket. It was fun to imagine what I would do with all that money! Apparently I'm bad at the lottery because I accidentally picked the same number for the powerball twice, and unfortunately I didn't even win $1! Yesterday morning though, I found $7 in my pants pocket and treated myself to a (black) coffee from my favorite coffee shop. I may not be a billionaire, but that made my week anyway! I didn't watch the awards show, but I did check out the fashion the next day! There were so many interesting dresses and silhouettes this year, so it was hard for me to pick four favorites. From left to right, my picks are Lily James, Julianne Moore, Lady Gaga, and Gina Rodriguez. I'm SO excited that my 2016 planner came in the mail this week! I've been looking forward to it coming for a while, and it's even better than I expected. The company made a few changes from last year's model, and I really like the improvements! I'm going to be writing a full review of the planner next week (along with other Etsy finds), but I had to include it as a favorite this week! The Bachelor - Some of the girls seem pretty sweet, but I'm just ready for an Olivia implosion and another freakout by Lace! So far I'm not really rooting for any particular girl, but I'm liking this cast! Biggest Loser - I really like Bob as the host! This cast is pretty likeable, and I really love the concept of a last minute sudden death workout. The rowing challenge was intense! Right now, my favorite contestant is the girl from the Voice. She really puts in 100% to each workout, and I'm pretty obsessed with all of her braided hairstyles. My Diet Is Better Than Yours - This is a brand new show that started this year, and I'm loving it. The concept is that five overweight contestants each pick five different weight loss plans. These range from a vegan, holistic diet to a "no-diet" lifestyle change. It's interesting to see how each diet is working for different people. Really interesting concept, and I can't wait to see which plan ends up winning! My money is on the superfood swap! Masterchef Junior - These kids are good at cooking! It's so inspiring for me to see these pint-sized kids making such amazing dishes. My favorites are Kya and Zac- Kya is just the cutest! I also really like Christina on this version of the show. I wasn't a fan of her on the regular Masterchef, but with the kids she's really endearing and sweet. American Idol - I'm mostly watching it during auditions because I'm in love with Harry Connick Jr. As far as singers go, I really liked the guy who sang Phantom of the Opera, and La'Porscha! 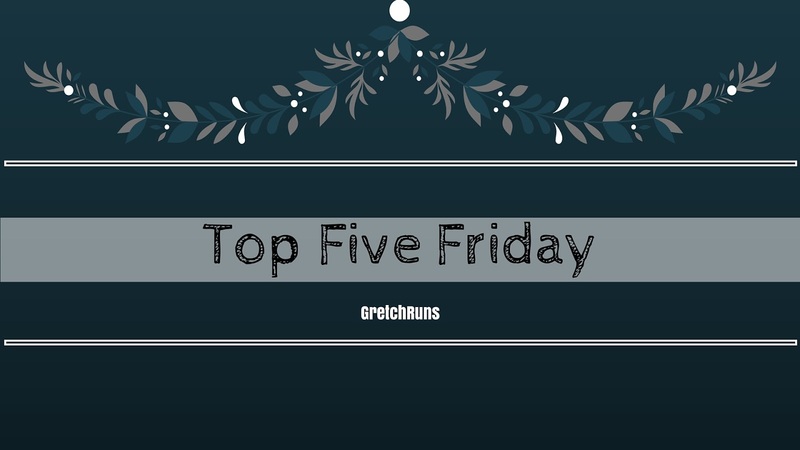 This week, I wanted to share some oldies-but goodies- that I've been loving lately. I was never a fan of The Who until college. We played an entire show in marching band with songs from the Who, and I'm still obsessed with the group today! I heard this song for the first time in a spinning class. I love it for hill climbs, because it has such a great steady beat the entire song! This is also a really fun song to sing along to! If I were ever brave enough to do karaoke, this might be my song. Someone get me a guitar so I can learn the opening riff on this song. Seriously so good! Dan introduced me to Rush, and this is now the song that I kick off every race with! It has such a great, intense feeling to it, but a slow beat so that I stay focused and don't take off! Let's play a game of "one of these things is not like the other". What can I say...Barry White's voice just gets me every time! If you need to be cheered up, play this now! What are your favorites for the week? Do you have any new TV shows you're loving? Did anyone win any money in the lottery? What would you buy if you won the jackpot? First thing would be a house! That would definitely make me less stressed right now! * Items with an asterisk are affiliate links - purchasing an item through the link will earn me a small percentage of income. Thank you for your support! No money won in the lottery, but we did start binge watching a new show, Scandal on Netflix. If I ever won a substantial lottery pot, I would take care of some family members and donate most to charities. I haven't heard of Happy Planner! There's so many great brands out there. Seems like your 2016 is off to a great start! I'd be happy with $7 on my pocket too! Every bit counts, huh? Especially when you're saving up to buy a house! I'm so sad my comment didn't work yesterday! I posted today that I've been super busy and haven't be able to comment as much as usual, but I couldn't pass up that great post! Anyways, I just wanted to encourage you and tell you how excited I am for this year and your blog! It's also awesome that Dan is a photographer, definitely definitely use that! Ughh I wonder why it didn't post!? Sorry about that. You're right..every bit counts! One of Jake's classmates in his guitar class at school pulled out a rendition of Sweet Child O Mine and we all just about died. I love it when teenagers surprise us like that. So much hidden talent! Happy Friday, Gretch! Woohoo! OH man! That would be so funny. Such a great song though! My EC planner came this week & I already feel better organized! Seriously. I just wish I could have a planner + running journal in one, and I'm sure I could, but the dang thing would be huge! The planner probably won't come with me on vacation, but my running journal does! I really like the debut of Shades of Blue. I actually add all of my running details to my planner! There's spots for each day where I add my workout, then I log everything in Daily Mile online. It works for me, but you might want more detail down in a book. I didn't realize lake Michigan was that many miles around???? It's a big lake! I think it's deceptively big because it's not wide across, but is very long. I agree that the Bachelor is a bad use of time, but I like it on as background when I'm working! I actually found the red carpet to be underwhelming for the Globes. There were a lot of dresses I didn't like, and the ones I did were both blue. Kate Winslet and Bryce Dallas Howard. There were tons of blue dresses! And I agree, pretty underwhelming. A lot of my favorites (JLo, Jennifer Lawrence) were big duds for me. Thank you Gina! Sorry that you didn't win, but it's fun to have that opportunity! It's the closest that I've ever been to being a million/billionaire! I love the Plum paper planners. I've used a few different brands and somehow Plum is always my favorite. That's good to hear that I'm not alone! Plus, its right in the middle of the planner price range which is good for me. i love HCJ too! he is hilarious. i've been watching the auditions too. Steve's book was amazing!!!! I am giving away 2 copies of it on my blog. I think everyone needs to read it. I just added a link to your blog! That's great that youre giving away some! That planner is so pretty! Love the cover. Can't wait for the review. Happy Friday! Love that planner! I'd love to hear more about your opinion on it - It seems like an awesome substitute for a super price Erin Condren!Have a great weekend! I'll be posting about it on Wednesday! That run around lake Michigan sounds incredible! i love ben - he's such a sweet guy! I like him a lot too! Actually seems normal and genuine. You've just inspired me to read that book! It looks so good and sounds like a great read. (Also, go Hawks! :) Haha sorry). Along with the Bachelor (I'm addicted, it's bad), I've been watching Parks & Rec on Netflix. It's hilarious! It's SO good. You'll seriously devour it in no time. I've watched a few episodes of Parks and Rec but I can't get into it for some reason! Haha well that's good for her! Wish I got my money back ahah! finding money is the next best thing to winning it, right?! that book sounds really interesting. love your new planner, and oh wow Lily James looks amazing, but I just love her! I hope you check it out! It's so amazing! i LOVE my planner!! i just wish it were a tad smaller so i could carry it in my purse.